Black Grace returned to Meany Hall this Thursday evening, February 21, 2013, as part of the UW World Series. 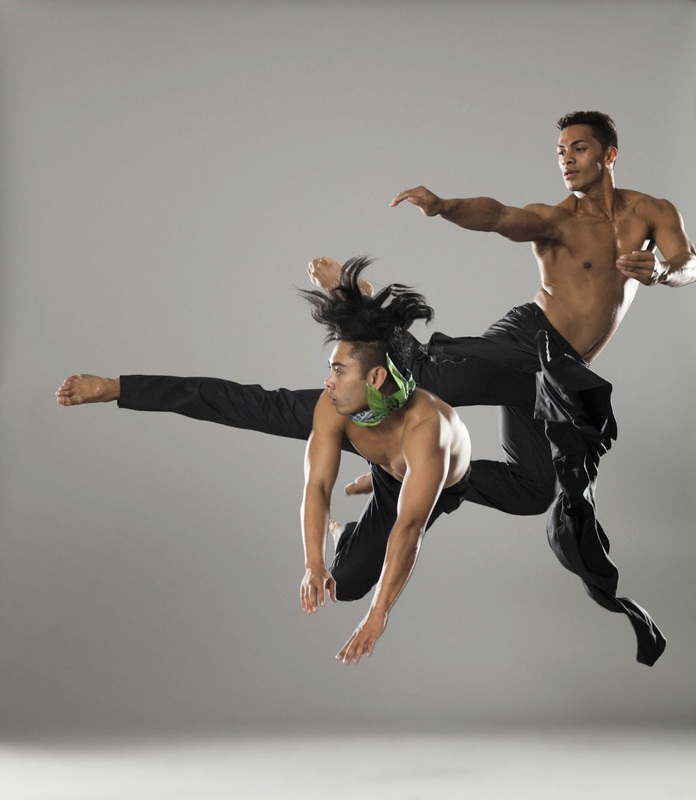 Artistic Director and choreographer Neil Ieremia presented Pati Pati, Amata, and Vaka. Mixing traditional Samoan and contemporary dance, the athleticism of all the dancers in rhythmical unison was marvelous. The pieces, while connected by similar movement vocabulary and choreographic structures, became more complex in both meaning and choreography work by work. Pati Pati was a compilation of excerpts from older repertoire dating back to 1995. Influenced by traditional Samoan Sasa (seated dance) and Fa’ataupati (slap dance), the dancers began seated on the floor and produced dense body percussions and rhythmic patterns with breaths and slaps that resembled children’s hand games. Rich orange tones illuminated their syncopated movements and created a ritualistic sense of community as they aligned in a triangle formation. They also gave the illusion of a single heart beating and expanding slowly as their torsos swayed, alternating from side to side and front to back. While Pati Pati had an earthy feeling, Amataplayed with wind as the dancers suspended themselves in mid-air. For this production, Ieremia presented the third act “o le amataga fou” (A New Beginning) of this full-length piece originally choreographed in 2007 for twelve women. The work began with a single string instrument, but the vocals and drums slowly wove themselves in just like the dancers wove themselves linearly across the grid pattern lit on the floor. The Samoan fine mats known as “ie toga” inspired this dynamic lighting and floor patterns. Recurring images of staccato elbows going up briefly brought to mind the last moment of Alvin Ailey’s first section in Revelations. Yet these moments were interlaced with flinging arms and repeated level changes, like the gravity defying leaps that landed in rolls on the floor, which helped convey an overall sense of struggle. It was refreshing to watch different partnering choreography as duets found attachment points at the back of the neck or the abdomen. Vaka, a Seattle premiere, blew the evening away with its imagery of nature and water. Ieremia took the definition of vaka (canoe) and transformed it into an hour-long piece exploring the journey of people who leave the islands and move to New Zealand, but also the vessel that carries our hope for life. Clad in black, the dancers began the piece by walking and changing facings arbitrarily as if they were chess pieces moving on an invisible board. Then duets sprung into existence. Repeated lifts where the elevated dancer’s body was fully extended recalled images of whales emerging from the ocean. Some striking partnering moments included a male dancer spinning a woman by the wrist and ankle, suspending her above ground. Acrobatic flips onto one dancer’s shoulders evolved into the carrier becoming the carried, and other lifts landed one dancer atop another’s feet while the first lay supine with their legs up. Ieremia illustrated the image of the vessel in many beautiful ways. Dancers lugged each other like backpacks across the stage in a journey to the unknown. Historical and political events were projected onto three dancers’ bodies, exemplifying how everyone is a vessel filled with history and culture. Stunning photos of the islands were also projected onto a piece of fabric previously used as a prop to resemble water. When the fabric was pulled off stage, a woman was dragged away on top of it. Perhaps here Ieremia was suggesting the memories of the islands were vessels too. The dancers’ voyage from their nature-filled life to urban land was depicted by Bonnie Burril’s gorgeous tree-patterned lighting and the sound score evolution from nature sounds to electronic music. With hopscotch bounces, rugby drinking parties, and an everlasting fight to survive in the city, the performers seemed to maintain their vibrant culture and values in their muscles and bones.